A focus on mixed media techniques including using paint, gesso, and any other media on layouts and on surface design to enhance your projects. Hello! It’s Réka and today I am sharing with you a very cute, very nice and very lovely way to make your own embelisment for your layout or any other projects and we will be using the gorgeous „Sundance” Traveler’s Notebook Kit. The first thing you have to know about me that I love coffee latte but I have never taken a picture of it and I have never documented it. But last week I gave up them and I did the previous two things and of course my own hand-made embelisment. Now let’s see the hand-made embelisment which is a coffee cup. I have choosen the coffee PL card from the February 2017 printables to do this. I have edited this illustration in the Microsoft Word program and I have printed it twice. Because for firts one I have used white cardstock which became the base of my layout and the other one has been printed on the copy paper which was the samplet for the coffee cup embelishment. I have cut the cup out of the copy paper, after that I cut off the different parts and I have chosen the papers from the Pretty Little Studios: Wish You Were Here 4×6 paper pack collection for them and drawn around it and cut it out of and adhered them onto one pieces of white cardstock which cut it around as the shape of the cup. The last steps were to embroider it and add the alphabetic stickers from the previous kits. The embelisment was done and I put it onto the page and I really love the result. Finally I have decorated the layout. I have fussy cut flowers out of the flower paper from Pretty Little Studios: Wish You Were Here 4×6 Paper Pack and the hearts were used to create a clusters on the top and the bottom part of the page to make balance. The hello word washi tape was the final touch to complete my layout. I really love this layout and the layout’s message. 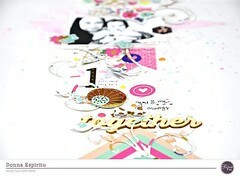 Categories: Art Studio | Tags: embellishments, Exclusives, Fussy Cutting, pretty little studio, Printables | Permalink. and exclusive printables (Main kit and TN printables) you can find in the Digital Shop as well. You will need two cardstocks – 1 for the cut file and 1 for the base where you will adhere the cut file. Adhere the negative part of the cut file to the other cardstock, set the ‘good or positive’ cut file aside. Using a piece of plastic (any will do, just make sure it’s clean), spread watercolor (or any medium you prefer, diluted in water) to the surface. Start with one color first and build up the layers one after another. While the base is drying (or you can use a heat gun to help it dry faster), use different patterned papers as backing to the Sunshine cut file (I used a pencil to trace the floral parts of the cut file and cut manually with scissors). Once the base is dry, adhere the Sunshine cut file backed with patterned papers. Use foam tapes to add dimension to the cut file. I added some fun details like this wavy flag and clusters of sequins and stickers. Different heights added interest to the overall look of the whole page. Here, I used different thickness of foam tapes to adhere the photo and other embellishments like stickers and word arts. The holographic embellishments are so pretty in person! That’s all from me today but I will be back in a few days to share another project with you all. Categories: Art Studio | Tags: art studio, Donna Espiritu, exclusive cut files, Exclusive printables, Exclusives, mixed media, pink paislee, Scrapbook Layout, Scrpbook, Silhouette, silhouette cameo, Silhouette Cut File, Summer Lights, Tutorial | Permalink. Heyyyyy again all!! Stephanie Gold here, back with another project using the incredible August Travelers Notebook Kit >>> get it HERE!! I wanted to show you all another super fun way you can use this kit so I put together a little gift card holder with coordinating tag. This mini envelope was made using a piece of the 6×6 pattern paper from the kit and a We Are Memory Keepers Envelope Punch Board (this thing has changed my lifeeee). I accented the front of the envelope with a couple cut outs, one of the see through stickers and the clear paper clip. For the tag I layered two different papers cut in different tag shapes and stacked them with the ephemera. That flamingo was meant to wear sunglasses don’t you think??! A small bow of black and white twine tops it off. Thanks again for stopping by!! Much love and happy crafting!! Categories: Art Studio | Tags: August 2017 kit, gift packaging, gift tags, gift wrap, stephanie gold, Travelers Notebook, Travelers Notebook Kit | Permalink. Hi everyone! Audrey here to share another page I made with my most favorite Clique Kits kit EVER! The August Malibu kit featuring Pink Paislee Summer Lights! I find it easier to work with a kit when there are also amazing cut files to go with them! I used this “Scallop” cut file that goes along with the August monthly release. You can find it in the store HERE. This file reminded me of scales on a fish (or mermaid!) and with the other mermaid elements in the kit also, I felt I needed to do a mermaid page. I found this photo of my daughter on the boat and I loved her messy hair blowing in the wind, her smile, and her purple life jacket that went perfectly with the colors in the kit. I added a few hints of scalloped stitching, and of course the mermaid chipboard on the bottom right. To help your eye move across the page, I added a thin strip of polka dot paper on the left side of the page. Thanks so much for watching and enjoy the August Kit! Categories: Art Studio | Tags: Audrey Yeager, August 2017 kit, cut files, Malibu, mixed media, pink paislee | Permalink. This month’s kit is loaded with sunshine, beaches, popsicles… basically anything that reminds you of summer! I had this adorable photo of my two littles super happy while eating their homemade popsicles, I knew it was the perfect picture to document with this kit. I used the insanely adorable and neon gel pens (included!!) to create little faux “stitches” around certain parts of my page. And these stickers! Eek! They are see through and amazing. Worth mentioning as well is this stitched popsicle. So. Many. Heart Eyes. Categories: Art Studio | Tags: art studio, August Kit, stephanie gold, summer, Travelers Notebook | Permalink.